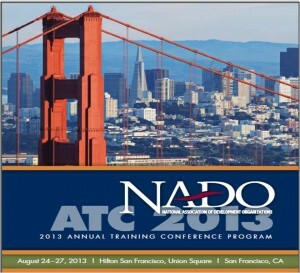 We look forward to seeing you in a few days at the National Association of Development Organizations 2013 Annual Training Conference (ATC) in San Francisco August 24 – 27. The conference will be held at the San Francisco Hilton Union Square (http://www3 NULL.hilton NULL.com/en/hotels/california/hilton-san-francisco-union-square-SFOFHHH/index NULL.html) – a fabulous location (http://www NULL.visitunionsquaresf NULL.com/) in the heart of the City by the Bay! As always, the conference was planned with much input from NADO members throughout the past year. With 40 plenary and breakout sessions, learning labs, conversations cafes, and mobile workshops – as well as special events that will allow for great networking – we think we are offering a strong event that covers a wide range of issues and topics, allows for different forms of learning, provides ample opportunity for peer networking, and showcases various members’ noteworthy programs and services. To help you plan your conference experience, please take a look at the conference program (PDF). The program is also available on our new NADO ATC mobile app (download for free at the Google Store (https://play NULL.google NULL.com/store/apps/details?id=com NULL.crowdcompass NULL.app98DfFZUxiR) or Apple store) (http://www NULL.apple NULL.com/itunes/). To learn how to access the conference app, go to page 15 of the program. Please visit regularly to be sure you have the most current information. We will be uploading additional speaker presentations and bio statements in the coming days. Additionally, NADO has applied for AICP CM credits for many of the sessions. Visit page 18 of the program to learn more. This year’s Opening Reception will offer locally-sourced wine and cheese and we are thrilled to be able to bring these local delights to the conference. Following the reception, there will be plenty of time for you to enjoy a great dinner at one of San Francisco’s many eateries. There are many options within a short walking distance of the Hilton, or you can jump in a cab or hop on the trolley to Chinatown (http://www NULL.sanfranciscochinatown NULL.com/), North Beach (http://www NULL.sanfrancisco NULL.travel/neighborhood/north-beach/), Fisherman’s Wharf (http://www NULL.fishermanswharf NULL.org/) or any of the many diverse neighborhoods for a great meal. Don’t forget to stop by NADO’s 2013 Innovation Awards reception on Monday evening to learn about the many exciting projects our winners have to share. Be sure to bring the Raffle Card that is in your registration envelop so you can have a chance at winning a Mini iPad. All you have to do is meet and learn about four of the projects, fill out the raffle card, put it in the box, and be present for the drawing. To learn more about this year’s Innovation Award winners, click here to download the awards booklet (PDF). During the conference you can follow NADO’s Twitter accounts, @NADOWeb (https://twitter NULL.com/NADOWeb) and @RPOAmerica (https://twitter NULL.com/RPOAmerica/lists). Also, you can chat with fellow attendees and NADO staff about the conference (and get conference updates) by using #NADOATC. Be sure to use the ATC 2013 app to stay on top of the events and visit our Facebook page (https://www NULL.facebook NULL.com/NADO NULL.org) to hear what is happening throughout the conference. We encourage you to use social media to learn more about NADO and to share your program’s successes and achievements. Also, with very generous support from VC3 (http://www NULL.vc3 NULL.com/Pages/default NULL.aspx), we are able to offer complimentary Wi-fi throughout the conference in the meeting rooms, registration and coffee break / exhibitor areas. The information needed to access the Wi-fi is on page three of the program. Conference registration will be open on Friday, August 23rd from 4:00 until 6:00 pm and will re-open on Saturday at 7:30 am (until 5:00 pm) and again on Sunday from 7:30 am until 5:30 pm. Our Conference Registration and Information Center is located in the West Lounge on Friday and then moves to the East Lounge for the rest of the conference. Check in at these locations to receive your conference packet and name badge. See you in a few days in San Francisco – we are all looking forward to an exciting and productive event! This entry was posted in Latest News, Training, Upcoming Events and tagged Featured. Bookmark the permalink.